The #1 reason people use ice melters is for safety, and no one understands that better than Cargill. 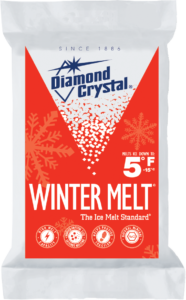 Their Diamond Crystal packaged ice melters are formulated to cover a wide range of winter conditions. They know that melting speed, effectiveness at various temperatures, color tinting to better enable uniform coverage, corrosion inhibition, and time-extended activity from blended ingredients are important factors, so they have a range of products to fit what you are looking for. And they stand behind their products—with nationwide service and support. Unique sizing mixture of large and small crystals of natural sodium chloride – small crystals melt on contact and large crystals provide longevity and instant traction. Works best at temperatures of 5 degrees Fahrenheit and above. Leaves no oily residue. A green-tinted, high performance ice melter containing a blend of sodium, potassium and magnesium chlorides for faster, colder temperature melting than regular rock salt. GreenMelt® ice melter is green-tinted for easy-to-see coverage on ice and packed snow. Formulated for minimal to no staining when used as directed. Application: Application rates vary. At +5 degrees F. and above, spread one-half to one cup per square yard of Diamond Crystal® GreenMelt® ice melt evenly over ice and snow-compacted surfaces. At 0 degrees F., use 1–1½ cups. Quantity and melting action depend upon temperature and thickness of compacted ice and snow. A specially formulated blend of magnesium chloride and sodium chloride which allows for fast action and lower application rates. Works down to -10 degrees Fahrenheit. Jiffy Melt® ice melter is the cost-effective choice over premium blends and more expensive substitutes. Leaves no oily residue. Application: Application rates vary from one-half to one and one-half cups per square yard of Jiffy Melt® ice melter evenly over ice and snow compacted surfaces. Quantity and melting action will depend upon temperature and thickness of compacted ice and snow. Melts to -25 degrees F. Fastest, most effective ice melt available. Premium-priced, similar to magnesium chloride, but pound-for-pound, melts twice as much ice.